The brainchild of drummer Bodo Schopf (Michael Schenker Group, The Sweet, Falco, et al), and featuring Pink Cream 69 vocalist David Readman, Pendulum Of Fortune returns with their second album, Return To Eden. 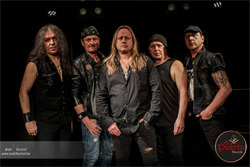 The album also finds the band with new and second guitarist Matze Erhard from the band Crime. Pendulum Of Fortune's music might best be described as melodic hard and heavy rock laced with some blues. 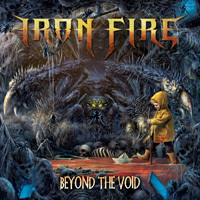 While not entirely roots rock, there is definitely a classic Seventies heavy rock vibe coursing through the tunes. And you get a lot of songs, 14 songs over one hour. You may get your money's worth, but I found it a bit much to consume in a single listen. Also, some songs like Skin And Bones, Never Be, and Return To Eden, I simply found tedious with their slow and steady groove. But Pendulum Of Fortune regained my interest with the smart and catchy rockers Broken Universe, the instrumental Rockanini, and One Of A Kind. That last song has something of a funky Southern rhythm and blues groove and a dash of harmonica. It was my favorite song here. There's a couple of ballads with Don't Make A Fool Out Of Me and Wings Of A Dove, which has a flaming guitar solo. The band also does a cover of ELP's Lucky Man, which is pretty darn good. All in all, with Pendulum Of Fortune's Return To Eden I found myself liking only some songs and not the whole album. Nevertheless, for classic blues infused heavy rock, Pendulum Of Fortune is on target. Check them out and support the band. With Pendulum Of Fortune's Return To Eden I found myself liking only some songs and not the whole album. 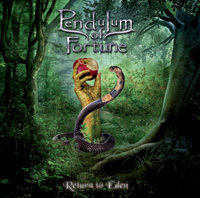 Nevertheless, for classic blues infused heavy rock, Pendulum Of Fortune is on target.